David Lewis Anderson, born in the United States of America, is a scientist whose interests are in spacetime physics, special relativity and global community service. Anderson received multiple degrees, graduating with honors in engineering, physics and philosophy. 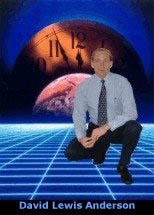 He has issued multiple ground-breaking papers relating to time technology and also for time reactor designs. His published works include more than thirty articles and video lectures on spacetime physics, time control technologies and methods and the philosophy of time. He has appeared on numerous radio and television shows in the USA and worldwide. Anderson founded the World Genesis Foundation in 1999 with a mission to "Leave No Child Without Hope for the Future," creating new educational opportunities and hope in areas of the world where these opportunities where limited or did not exist. Since that time his has been active as a speaker and Ambassador for Youth for the United Nations Educational, Scientific and Cultural Organization, for the Romanian government and other nations of the world. Anderson served as the foundation's President and CEO until 2011 when he left the foundaiton to pursue other interests abroad. "Where shopping creates hope every day"